We’ve heard a good deal about the amount of bandwidth that video demands from the network. 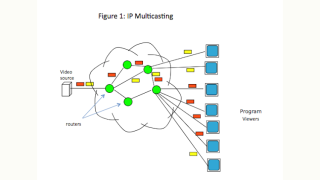 IP multicasting is a method to reduce that demand. In some cases, it can be rather complex to implement. However, in many video delivery settings, it’s nearly impossible to avoid. We’ll try to give you a solid explanation of how it works. (1) Any link contains a stream if and only if there is a downstream viewer. (2) The number of streams on a link is determined by the number of programs being delivered on the link, not the number of downstream viewers. So, how do the routers determine which stream to forward downstream? Lets’ say one of the streams getting red packets wants to see the program represented by the green packets. This is called a leave packet. Then, it sends a join packet upstream requesting the green stream. The packet continues upstream until it reaches a router that is receiving a copy of the stream. That router begins to forward the green stream downstream. This process of leaving and joining a new program stream can be a source of significant delay, especially if the new stream requires an encryption key to be decoded. However, new products using multicasting have made great strides in reducing this program change time. Streams which are being multicast use IP addresses in the range from 224.0.0.1 to 239.255.255.255. And, inexpensive switches that can’t recognize IP level multicast addresses can be a problem. If they do not have this capability, they will broadcast the steams on all links, flooding the network with packets. Switches that have the awareness of IP multicasting use a method called IGMP Snooping to alleviate this issue. IGMP (Internet Group Management Protocol) is the standard that defines how IP multicasting is to be implemented. Phil Hippensteel, PhD, teaches information systems at Penn State Harrisburg. He is a regular contributor to AV Technology.